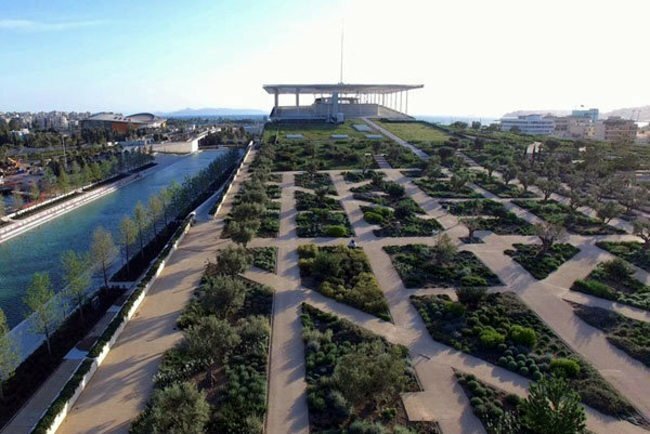 Once completed, the Stavros Niarchos Cultural Center and Park in Athens, Greece, will be one of the largest public spaces in Europe planted with only Mediterranean, drought-tolerant plants. At the start of the project, landscape architect Deborah Nevins and the design team were presented with a 40-acre, totally flat, degraded site. The Park now rises over the buildings, approximately 96 feet from the street, allowing the city to have a view of the sea, which was previously blocked by an eight-lane highway. The project included the planting of 1,400 trees and 310,000 Mediterranean shrubs and perennials. At 1.7 acres, one of the green roofs is planted with 164,000 grasses, cultivated from seeds collected in the hills of Attica, resulting in a roof which looks like those very hills. The Stavros Niarchos Cultural Center includes the Park, the National Library, and the National Opera House of Greece. It is widely considered one of the most important cultural and educational projects ever undertaken in Greece. In 2018, the project was awarded first prize for Innovative Concept or Design by the European Garden Heritage Network, and the Green Roof Leadership Award from the International Green Roof Association.